This year’s annual AREA workshop took place in historic Sheffield, UK on March 26 and 27. 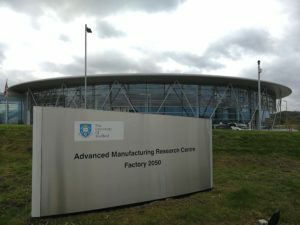 Sheffield is home to the world’s oldest football club, a powerhouse of steel production in the 19th century and, of course, now home to Factory 2050, the first building to be completed on the University of Sheffield’s new Advanced Manufacturing Campus. 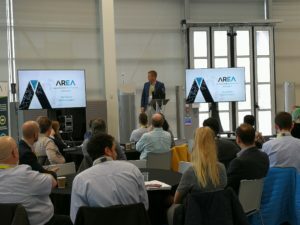 The Advanced Manufacturing Research Centre (AMRC) kindly hosted the workshop which saw more than 70 participants from a range of industries, including energy/utilities, buildings and infrastructure, aerospace, defence, industrial equipment, mining, automotive and consumer high tech, converge on the shop floor of Factory 2050 for a jam-packed series of presentations, interactive workshops, demonstrations and networking. Day 1 was opened by AREA Executive Director Mark Sage and AREA President Paul Davies, who delivered a high-level overview of AR, supported by leading companies and AREA members who have deployed AR. 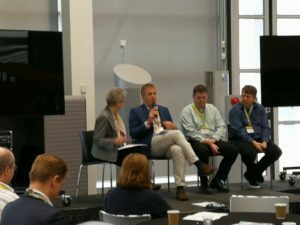 ExxonMobil, Welsh Water and Boeing all helped paint a detailed picture by sharing their use cases, experiences and challenges. We then heard from Jordi Boza of Vuzix who shared his thoughts and ideas of how to get started in AR followed by a presentation by Atheer that took attendees through a case study showing how Porsche transformed automotive dealer services with AR. The last session of the day was an intense, hands-on session presented by the AREA’s Dr. Michael Rygol who helped attendees get under the skin of AR by discussing and documenting use cases and their key requirements in working groups. Presentations by attendees led to some healthy debate and interesting insights. The day was finished off with an informal networking session where participants had the opportunity to take a closer look at some of the organisations who were there with demo tables and to connect with colleagues both old and new. The second day was an early start at 8am and then straight into a presentation from Theorem Solutions on the cognitive gap and potential of XR technologies followed by a lively panel discussion on workforce challenges led by AREA Board member Christine Perey of PEREY Research & Consulting with representation from Boeing, ExxonMobil and VW Group UK. We then explored more on the AREA’s Research capability by looking at past projects before jumping into a master class on AR human-centred design from London-based ThreeSixtyReality. A full agenda took us into a presentation on Human Factors and related safety challenges and a pre-recorded session on overcoming the challenges of AR security followed by a polished presentation from Microsoft on their MR strategy and the eagerly anticipated HoloLens 2. A three-minute provider pitch finished off a jam-packed day before participants headed home. Staying in the AR game is tough. Organisations should consider both the opportunities and limitations of the current evolving environment. The AR supplier ecosystem is continuing to grow, offering new and varied opportunities. Clearer understanding and definition of the barriers to adoption (including safety, security, user experience) and paths forward to overcome these is essential. Sound, appropriate use cases are key to learning more about AR. The number of use cases where AR delivers value continues to grow (and we need to capture and share these – hence the ASoN initiative from the AREA). Digital eyewear to support AR is maturing rapidly (e.g., new models from Vuzix and Microsoft). Ensure you stay informed on new developments. There is broad interest in AR across a number of industries – from industrial flooring to mining. Considering the business benefits of AR is essential to obtaining buy-in from stakeholders and decision-makers. There may be significant issues around safety and security where AR is concerned. Don’t ignore them. The AREA annual workshop is an opportunity for members and non-members to connect, learn and share more on AR. We at the AREA are fortunate to have the opportunity to do this annually and it wouldn’t be possible this year without the valuable support of AREA members and our sponsors: Theorem Solutions, PTC, Vuzix and Atheer. What is Assisted Reality – and How Can You Benefit from It?